The I-80 corridor by Starved Rock (Ottawa, LaSalle, Streator, Peru, Spring Valley, etc) is zoned a 5b which means we can have plants that are hardy to -15 degrees. Living here our entire lives, we have come to find that this zone is not necessarily true. Many of us live in areas that are exposed and feel like the tundra. The winters have high winds and little snow cover which make for harsh environments for plants. This means that many plants that are labeled for zone 5 will not survive in our landscapes. This is especially true for the ornamental grasses in our area. 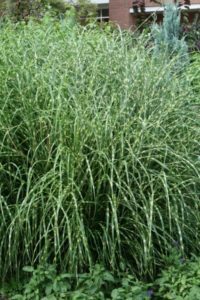 This blog post will help you better understand the ornamental grasses that will grow in our area and how to maintain them. I want to point out, ornamental grasses need sun. There are few exceptions to this rule, so make sure to find a place that has more than 6 hours of sunlight per day. This will provide the plants with ample sunshine and keep them standing tall. Grasses prefer to have mulch as a surrounding, but are usually tough enough to be planted with landscape rock as a cover. Initially grasses will need watered or if we are in a drought, but typically they like to be a touch on the dry side. With that said, please know that grasses grown in containers have different requirements. Once established maintenance is very simple. In the SPRING when the weather is starting to warm up, tie the grass tops together and cut down to about 4-6″ tall. New growth will start to emerge and a light fertilizer can be applied. What if the center of my has died out? This is a question that we get a lot. This happens for a variety of reasons, but most due to lack of sunlight and moisture retention. There are two ways to combat this problem. 1. is to clean the core out and add some soil which can initiate growth back into the center 2. Dig up the grass, clean the core, and plant back into the location. This should be done in the spring while the plant is still short. Reed grass is one of the most popular in our area. It is zoned 4 and can handle a wide variety of environmental conditions. One reason it is so popular is because of its growth habit. 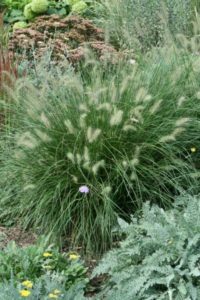 This ornamental grass grows upright with beautiful seed plumes that will hold through winter. It maintains its shape well and stands about 5-6′ with the plumes. 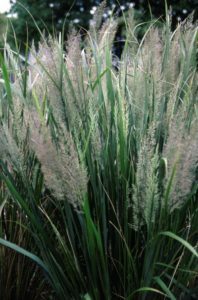 The most recognized cultivar is Karl Foerster which has green blades and tan plumes, but brachytricha, Eldorado, and Avalanche are also wonderful Reed Grasses. Miscanthus grasses are one of the most recognizable grasses in our area. 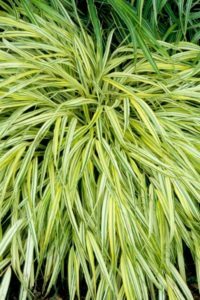 Striped Zebra grass being the most popular. Zebra grass has rows of horizontal white stripes that extend from root to tip. Shorter versions of this grass are Porcupine Grass and Little Zebra Grass. Looking for fall color?Miscanthus purpurascens (Flame Grass) has a wonderful fall display of reds, oranges and yellows. Gracillimus is a green bladed grass with beautiful red plums in the fall. Switch grasses (blue and red) are native to Illinois. They stand about 3-4′ tall and have very airy plumes. They are known for changing their color in the fall to a wonderful reddish tan color. The plant will give winter interest assuming there is not heavy snow cover to bend the blades. It can tolerate most soil conditions as well as being drought tolerant. 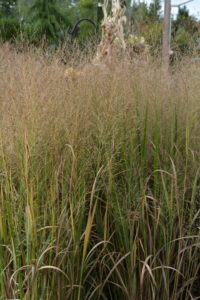 Because this grass is native to the prairie, if it is planted in a prairie setting, occasional observed professional burning may be necessary. Please do not burn Switch Grass in an ornamental setting. Panicum is also tolerant to salt spray so it does well along roadsides. Fountain grasses are tricky to grow in north central Illinois. Purple fountain grasses are used ONLY as an annual. They are known for their purple foliage, but can be used as a cut grass in fall arrangements. Hameln and Burgundy Bunny are two cultivars that will survive in a protected area in towns across LaSalle and Livingston Counties, but will typically die out if placed on the outskirts of town or in the country. This grass is known for their fluffy little tufts at the end of their thin blades. Hameln is a dwarf fountain grass cultivar that gets about 2-3′ in height. Japanese Forest Grass is the only grass that is recommended for partial shade. This beauty gets long yellow blades; the cultivar ‘Aureola’ has dark green margins. It only gets 18″ tall. This plant compliments hosta and astilbe by adding texture and bright color to shaded areas. Golden Japanese Forest grass was perennial of the year in 2009. It is a zone 4 perennial which means that it will survive in most locations. Hakonechloa does require more water than other ornamental grasses. 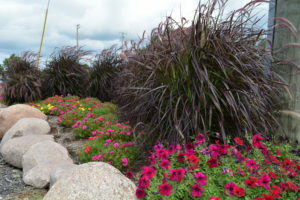 For questions on these Ornamental Grasses or on other varieties that we carry, please call us at 815-672-8135.